Although that may be surprising to some, it may make more sense in light of the following facts. These distracted driving facts reveal why this practice is so dangerous. Texting while driving can triple the risk of a collision – As one of the most common forms of distracted driving these days, texting while driving can divert drivers’ attention from the road for at least 5 seconds at a time, exponentially increasing the chances of a crash. At higher speeds, this can mean that drivers may travel as far as a football field or more without having their eyes on the roads. Distraction can happen even when drivers’ hands remain on the steering wheel – This is a lesser known fact about distracted driving, as many drivers operate under the assumption that, if they are using headsets or voice-command systems in their vehicles, they are not distracted behind the wheel. This is not, however, true, as the fact that a driver is multitasking behind the wheel – regardless of whether the motorists’ hands are involved – will serve as a distraction. Driver distraction can cause inattention blindness – Motorists who do just one other thing while driving can experience something known as inattention blindness, which means that they do not see their surroundings even though they may be looking at them. In fact, as researchers have found, the inattention blindness that can come with distracted driving can cause drivers to not see up to half of the critical driving cues (such as brake lights, traffic signs, etc.) around them. Distracted drivers often behave like drunk drivers – In addition to experiencing inattention blindness, distracted drivers can also display impairments similar to intoxicated drivers. Specifically, both distracted and drunk drivers tend to have impaired perception and coordination, as well as delayed reaction times. In busier traffic conditions, this can mean that even the slightest mistake can result in serious crashes. 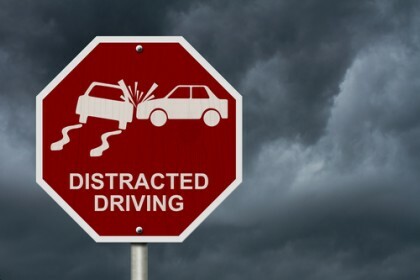 Many drivers see distracted driving as only a problem for other motorists – Despite the various campaigns and laws that have been enacted to try to curb driver distraction, many drivers continue to try to multitask behind the wheel, believing that they can safely do so. In fact, what may be more distressing than this is that many motorists believe that other drivers should be paying attention to the road but that they are able to safely multitask while driving. And this type of flawed thinking is what may be continuing to misguide people into diverting their attention to other tasks as they drive. Share your thoughts about distracted driving with us on Facebook & Google+. If you have been hit by a distracted driver, you can rely on a Portland car accident attorney at the Savage Law Firm for experienced help and aggressive legal advocacy.